It's Day 2 of our Bali Blog Hop! We're back with another inspiring tutorial for using these rich, gorgeous Bali prints! 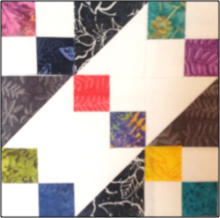 Today Stephanie from Stitched Together Studios shares her wonky version of the classic Jacob's Ladder block. Enjoy! 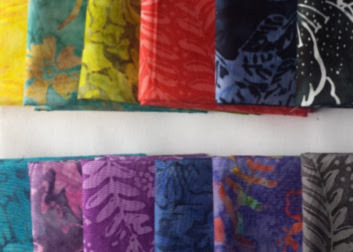 I love batiks … all colors, all designs, every single thing about them, so I was thrilled to open up my fabric package and find the Rio and Dolce collections! I think they blend together beautifully (as do most batiks) so I chose to mix them up and use them together. Pretty, but lacking a little something …. There is RIO in these blocks for goodness sakes, land of the samba, Carnival, Copacabana Beach, and the upcoming Summer Olympics! I could do better. (2) 5” squares of white, crosscut once into (4) half square triangles. 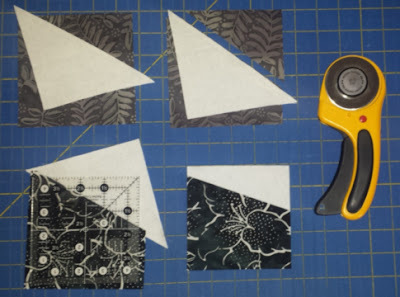 Four Patch Units (make 5): Sew 3-1/2” batik and white squares together in pairs, then sew the pairs together into 4 patch units. Using your 4-1/2” ruler trim block at a fun wonky angle. Half Square Triangle Units (make 4): Lay (1) white half square triangle right sides together at an angle on top of (1) 5” batik square, then sew along the angled line. 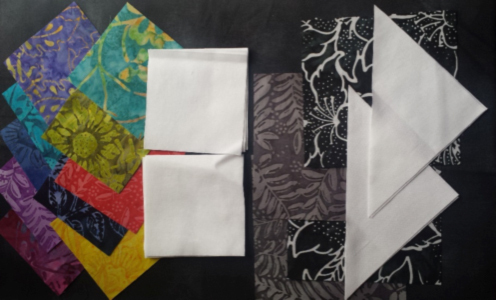 Trim batik fabric, then press with seam allowance towards batik. Again, use your 4-1/2” ruler to trim square at a fun wonky angle. 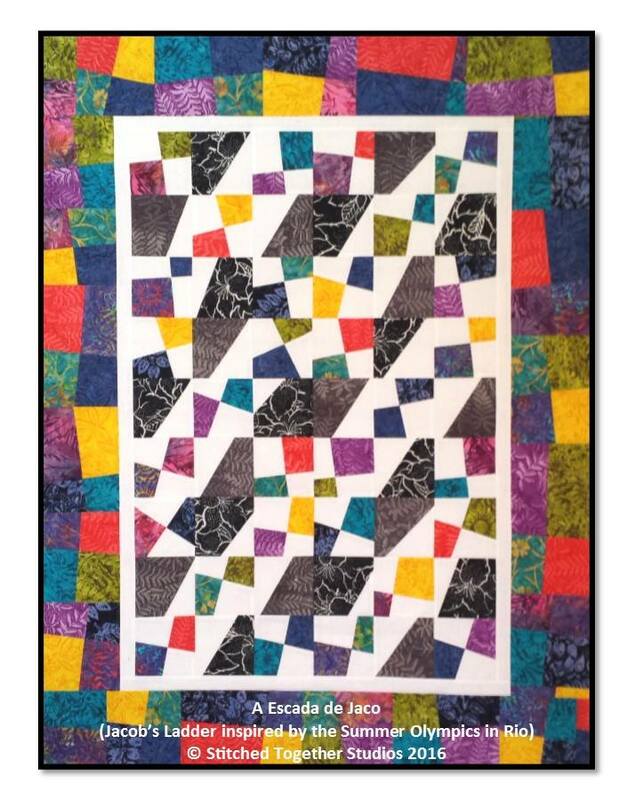 The finished block: Brazilian pizzazz! For a chance to win a fat quarter bundle of the Dolce and Rio fabrics we're featuring in this blog hop, make sure you're following us, either through a blog reader or by email (both options in the right-hand sidebar). Leave a comment below letting us know that you are, and also telling us if you've ever made a wonky block. Giveaway is open through Sunday, May 15th at 11:59 pm EST. I have not made a wonky block yet. I do like your block and would like to give it a try. Following you via email and Bloglovin. I've made wonky blocks....no sweat! I follow on Bloglovin also! I am following your blog. I've made wonky blocks using the Twister ruler. Following by email. I tried to make a wonky star block, but it just ended up looking bad. I follow you via bloglovin - I did make some wonky blocks to be inclused in a wall hanging project - problem was that they were small and you couldn't really tell they were wonky, looked like they were sewn by a 2 year old! I've made a couple of slice and dice quilts. They were fun and fast to make. 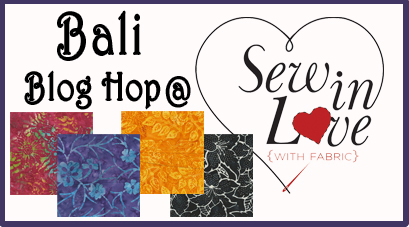 I subscribe to Sew in Love with Fabric and receive posts via email. I follow via Bloglovin. Yes, love wonky blocks...nothing has to match, and it's ok if points are cut off! I follow via email. 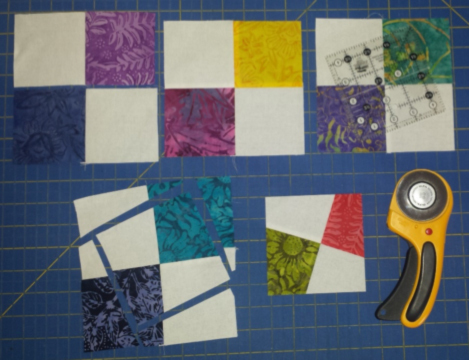 =) Yes, I've made wonky blocks and they work great for kids quilts. Yes, I've made wonky blocks. On purpose, most of the time! This block looks really cool and seems fun to make, I'll have to try it. I follow by GFC and email. I follow you via e-mail. I haven't made a wonky block but Jacob's ladder is on my to-do list. Thank you for sharing the detailed tutorial. Yes I am following you but I haven't made a wonky block yet. The wonky block is so much nicer than the traditional one, which I've never been the least bit interested in sewing. But now I'd love to sew a wonky one. I follow the blog via email. And, I have never made a wonky block. I follow by email. It has been awhile since doing a Wonky Block, but they are a lot of fun. This one looks like one I would do for a certain person in my life; so thank you so much for sharing it! No but I like the wonky star blocks. I follow via e-mail and Bloglovin. I made 1 wonky block. Just found your blog earlier from ChrissieD's and got my 1st email from you! I have made a few wonky star blocks for a quilt a couple of years ago, but this one speaks to me!!! I love batiks and I am gonna run to my sewing room and make this block right now!!!! Yee haw!!! I hAve NEVER made a wonky block on purpose but I actually think this one could be a winner. I made a quilt out of wonky blocks. I've made many wonky blocks but have never seen this technique before. May just get out some fat quarters and play this afternoon. I follow with email and GFC. I haven't made a wonky block yet. Oh, wow! I love it! I've made a few wonky quilts and they are so much fun! I follow via email. I follow by email. I have not intentionally made a wonky block, but have had a few turn out that way. I love wonky blocks. Your tutorial explains why better than I ever could. It's been awhile since I've made wonky blocks, but they are fun and the results are always amazing!! I follow you via email and Bloglovin!! Batiks are a favourite of mine too! Following by email.I have made a wonky block in a sampler BOM I joined. Love the wonky blocks, especially wonky stars. I follow by email. I've made a few wonky blocks for a swap. I've not intentionally made a wonky block, just a few cutting mishaps have made a block or two turn out that away. i am a follower and love to make wonky blocks! thanks! I follow via email. Yes, I've made one quilt with wonky blocks and it was really cute. I think the wonkiness gives the quilt a whimsical look. Enjoying your posts and ideas. Made a slice and dice throw in a class. I follow via email. Following on Bloglovin. I have made several "wonky" blocks in BOM. This is such a beautiful block! I like wonky houses, & I've made stacknwack's that are pretty wonky. I made a block that had a wonky border. It was my first time, and I was not happy with it. But your tutorial looks so easy, that I may revisit it to make a more pleasing one. Thanks. I follow your blog via a blog reader. I'm a follower via Feedly. And I've made wonky stars and wonky 9-patches. Thanks. Love, love, love this Escada de Jaco block. The finished quilt is so very modern, colorful and stunning! I follow via Google Friends Connect. I forgot to mention that I have made wonky blocks. I follow you by email, and I have made wonky blocks. They are lots of fun. Wow!!! Your Block is sooo cool! LOVE the Quilt!!! AWESOME!! I made one Throw with wonky blocks...very fun! Beautiful fabric! I've never made it wonky block but I like how they look. I follow by email. I am a blog follower of yours on Bloglovin and yes, I've made a few wonky blocks and love them, especially because I don't have to be so precise with stitching and cutting! I love batiks too! thanks for the chance to win some! I follow on Bloglovin. I have made a Wonky quilt but not like this one. Great quilt. Such fun and beautiful fabric. Have never made a wonky quilt, but I like yours. Must have found you on Bloglovin. I follow your blog. I have made far to few wonky blocks in my life, only a couple, but I hope to make lots more in the future. I follow you by e-mail. I have made a few wonky blocks and I really like this one! I follow with Bloglovin' and also Google(GFC.) I have made a lot of wonky blocks. I love this one. I follow on feedly and have not made wonky blocks. Yes, I have made wonky blocks, sometimes unintentionally! I follow via Bloglovin. I've made several wonky star blocks. They're great because points don't have to match! following via bloglovin. And, no I haven't made wonky blocks before, but love it. I follow via email. I've made tilted blocks, but never a wonky. This method makes it look so easy! I follow via email. I've never made a wonky block. I follow you by email, and yes I've made wonky blocks before; they are fun and freeing! I follow you on Bloglovin. I have never made a wonky block (intentionally anyway). Thanks! I am a follower by email. I have made only a few wonky star blocks. I follow by email. I have not made wonky blocks at least not intentionally. Im a follower of yours by email. I love this delightfully joyful wonky block! I've never made a wonky block, but I'm going to try this one. I follow via Bloglovin. Thanks for the awesome giveaway! I follow by email and Bloglovin. I have made a wonky block. I had a shoe panel and added strips around it, then cut it Caty wonkus. So fun. 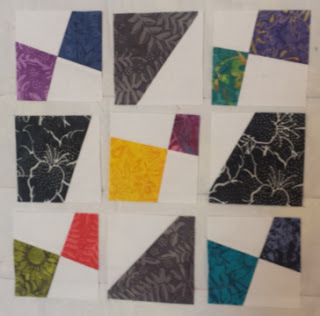 I have not made a wonky block but they look like so much fun. I'm following on Bloglovin. I am a follower via bloglovin'. I have never made a wnky block until now! Looks great though! I'm following on Bloglovin! I've never made a wonky block before, not on purpose anyway. :) Thanks for the chance to win! I have never made a wonky block on purpose!! I follow by bloglovin and email. 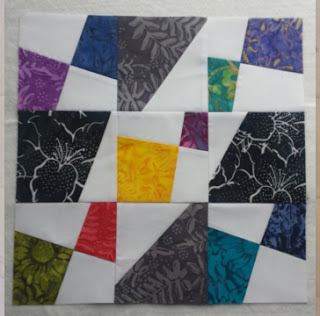 I follow on bloglovin' and I've never made a wonky block. Very nice looking block - the colors really make it stand out. I make wonky/liberated/improv blocks and like doing it! Thanks for the chance. Love the wonky block. I think this would help my OCD a great deal. I struggle with traditional, must match, perfect piecing. Wonky could be a big relief.